If Mars conceals a lake beneath its south polar ice cap, the planet must also have a hidden chamber of magma to keep the water liquid, a new analysis suggests. Signs of a 20-kilometer-wide lake, buried beneath about a kilometer and a half of ice near Mars’ south pole, were first reported in 2018 by a team led by planetary scientist Roberto Orosei (SN: 8/18/18, p. 6). The discovery kicked off a debate over what it would take to keep the lake liquid in such a frigid environment. 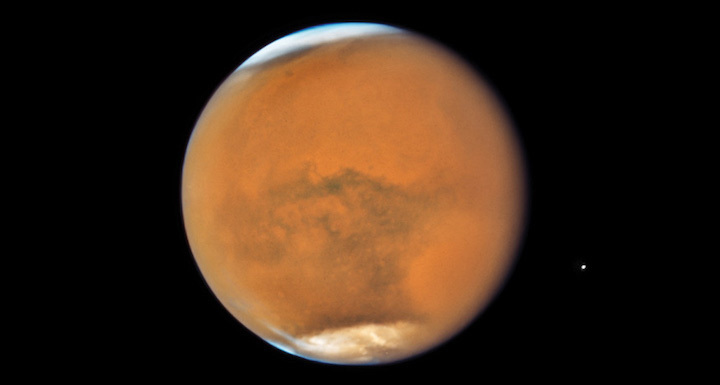 Planetary scientists Michael Sori and Ali Bramson considered various scenarios, including dust mixed in the ice cap to improve its insulating abilities and episodes of past volcanism on the Red Planet. The only way to create enough heat to explain the lake is if a subsurface pool of magma under the ice also exists, the duo reports in the Feb. 12 Geophysical Research Letters. The possible lake — the first report of so much liquid water existing on Mars today — appeared as a bright reflection to the radar of the European Space Agency’s Mars Express orbiter. The Martian environment, though, is too cold for water to remain liquid on its own. Orosei, of the National Institute of Astrophysics in Bologna, Italy, and his colleagues had suggested that salts dissolved in the water could keep its melting point low, allowing the lake to exist as a briny sludge. Conditions beneath the ice are still too cold — an average of –68° Celsius — to explain the lake’s existence just with salts, argue Sori and Bramson, both of the University of Arizona in Tucson. But their calculations show that if around 300,000 years ago, a volcano released magma into a chamber at least five kilometers wide and buried about 10 kilometers beneath where the lake appears to be, that pool could generate enough heat to still be melting salty ice today. Without salt, the magma chamber would have to be larger or closer to the surface, the researchers say. If the magma chamber is real, it would mean that Mars has been geologically active much more recentlythan planetary scientists think (SN: 3/4/17, p. 12). Previous studies suggested that the most recent geologic activity near Mars’ south pole was millions of years ago, at least. The chamber’s existence could also be a blow to the purported lake’s habitability: If the lake is only a few hundred thousand years old, that doesn’t give life much time to have gotten started. Sori and Bramson remain neutral on whether their findings make the lake more or less likely to exist. “Honestly, we’re not sure,” Bramson says. The researchers suggest that future searches look for either the magma chamber or the lake. So far, other radar searches using NASA’s Mars Reconnaissance Orbiter have not spotted the lake (SN: 12/22/18, p. 29). The jury is out among other researchers too. The new research doesn’t rule out the role of salts in melting ice, says planetary scientist Bethany Ehlmann of Caltech who was not involved in either study. But “this paper is a nice contribution that explores an alternative hypothesis,” she says. Orosei stands by his team’s observations. Theoretical arguments showing how difficult it is for liquid water to be present beneath the ice, he says, do not prove the water is not there. “I think that we are just entering a long and exhausting debate,” he says.